X-Strike Studios has released a new series called the Wasteland Survival Guide, a practical and fun set of instructional videos that teaches the essential skills that can save your life! Formed in 2003 by a group of friends from SUNY Fredonia, X-Strike Studios specializes in making videogame-related movies, shorts and series. Among its projects are Sidequest Has Left the Party, P. Rappa's Nth Mile Dilemma: A Ghetto-tastic Rap-Venture and now, the Wasteland Survival Guide, a six-part series packed with "good, sound advice" on how to survive in the blasted wastes. 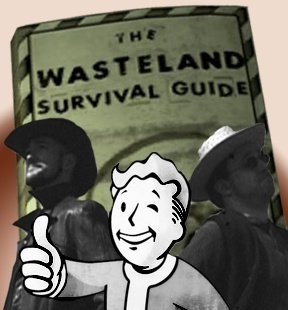 Presented as a 50s-style PSA in appropriately-degraded black-and-white, the Wasteland Survival Guide introduces viewers to Sam Survive and Pete Perish, two intrepid adventurers making their way in the post-apocalyptic world. From basics like food and shelter to the intricacies of combat, their day-to-day experiences will teach you all you need to know about getting by in this harsh, cruel world. They're kind of funny, too. The first three videos of the six-part series are now online, so don't miss the chance to hone your survival skills at x-strikestudios.com.